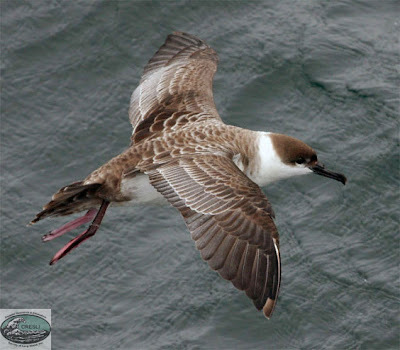 Greater shearwater Puffinus gravis, from John L. Turner. The Procellariinae includes the Procellaria petrels and the shearwaters. Procellariines are medium to larger tube-nosed seabirds with relatively long, sturdy bills. Compared to the Fulmarinae, they are more aquatic feeders, with an unfused lachrymal allowing for a more mobile bill (Campbell & Lack 1985). The petrels of the genus Procellaria have more strongly hooked bills than the shearwaters in the genera Calonectris and Puffinus. Calonectris differs from the other genera in being primarily found in the Northern Hemisphere. Campbell, B., & E. Lack. 1985. A Dictionary of Birds. A. & C. Black.